Avocados are native to Central America. Avocado culture is very ancient and was a staple diet for many cultures. Once discovered this strange fruit was carried to different parts of the world. 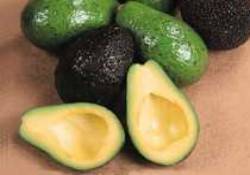 There are three types of avocados - Mexican, Guatemalan and West Indian. All varying in fruit, leaf type and hardiness to the cold. Late 19th century early 20th century Europeans started to select seedlings from Mexico and the rest is history as the avocado spread world wide so we all can enjoy the creamy healthy avocado. Beautiful evergreen tree. Ideal as a specimen tree in a good sized garden. Rich in oil (mono-unsaturated), protein and Vitamins A and B. Low in sugar and cholesterol. Large amount of minerals, calcium, iron and potassium. A great all-round food. On its own or in a salad, meat dishes or make your favourite guacamole. There are endless uses for this fruit. The fruit should be clipped from the tree with part of the stem attached. Do not refrigerate until the fruit has softened. A 7 year old grafted tree can bear in excess of 200 fruit annually. Provide a warm, sheltered sunny position. Protect from wind when young. Salt tolerant. Winter and spring rainfall is probably sufficient but give supplementary water in the summer. DO NOT LET YOUNG TREES DRY OUT OR SIT IN WATER. Any free draining soil is suitable. If planting in clay soils incorporate a clay breaker prior to planting. Fertilise every 3-4 months during the growing season. Young trees, 100gms of high Nitrogen fertiliser per application. Older trees gradually increase the rate. Organic fertiliser in early spring like chicken manure will help soil texture and improve the plant tolerance to Phytopthera (root disease). Prune to maintain the desired shape and size. Frost tender, especially while young, so protect with frost cloth. Hardy to -2 to -3°C once established.